ALEKO PTS10 Ultra Durable Dog Rope Play Pack Dental Teaser F.. Encourage your pet's curiosity with ALEKO's dog rope toys! Rope toys are a favorite among dog owners..
ALEKO PTS04 Ultra Durable Dog Rope Play Pack Dental Teaser F.. Encourage your pet's curiosity with ALEKO's dog rope toys! Each multicolor pack includes 4 different..
ALEKO DK5X5X4SQ Pet System DIY Box Kennel Dog Kennel Playpen.. 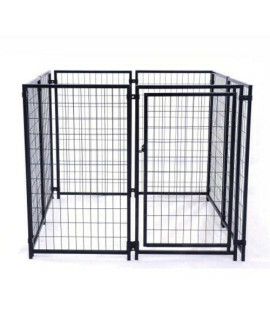 Features of ALEKO DK5X5X4SQ Pet System DIY Box Kennel Dog Kennel Playpen Chicken Coop Hen House 5 x ..
ALEKO 48 Inch Dog Playpen Pet Kennel Pen Exercise Cage Fence.. Specifications: Can be used for training, as a kennel, or for other purposes, both indoors and outdo..